CREATE A PROFILE: Once you've registered, it's time to create a trustworthy profile. Sitters should upload a quality photo, provide a well-written description of your experiences & skills, and upload references. APPLY FOR ASSIGNMENTS: Once you've perfected your profile, you can immediately begin applying for assignments! MESSAGE HOMEOWNERS: Not all homeowners list their assignment, and rely more on our messaging system to hire sitters. Browse house sitting assignments, and send a message to homeowners in the areas you are interested in. 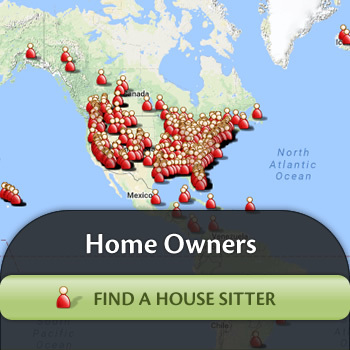 Home Owners - Find a House Sitter! 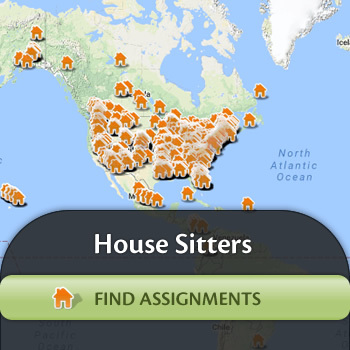 FIND HOUSE SITTERS: Browse house sitter profiles and post house sitting assignments any time you need a sitter! House sitters can communicate with you through messaging, and apply for your house sitting assignments. You can interview those that interest you, and hire the sitter that best suits your needs. PAYING HOUSE SITTERS: Many house sitters will take on your house sitting assignment free of charge, in return for the opportunity to travel without having to pay for lodging. Those who charge a fee are free to determine their own daily rate based on the unique requirements of your assignment. Feel free to get in touch with sitters and request more information about their daily rate. It has been a privilege to be part of Luxury House Sitting! reconnecting with many friends as we were driving to our housesitting jobs. We often housesit in our home area. We find the homeowners appreciate our service and will recommend us to their friends. Also, they ask us back! Your website has opened up a world wide opportunity of travel for us! Through your website we have spent several weeks in a small village in England and met so many friendly people and made contact with a couple who has become our friends. Then we headed to Texas with two of the most loving pups you will ever see. This couple has invited us to come again to their home. They are truly close friends now. And how could we ever forget our stay in Florida. We returned to spend a week with them recently just as friends not even house sitting. We have also been to Mexico recently. We stayed several weeks in the desert and only 5 minute drive to the beach. We have another house sitting lined up for later this summer in Florida in a beautiful home with lots to do and the company of a beautiful and sweet Boston Terrier. All of this is thanks to your website. You're doing a great job! Thank you so much for asking me to share my story! Being a part of the House Sitters with Luxury House Sitting has been one of the best experiences I have had. Meeting new people and their animal family members has been so much fun. I have been able to travel to unique locations and each has given me unexpected joy. Walking along beaches, hiking mountain trails and getting to know the culture have been many of highlights. The animals are so wonderful that I have fallen in love with them and many times it is sad to leave. I am ever grateful to those I have come to know while sitting and to Luxury House Sitting for connecting us. After more than 38 years as an IP ( instructor pilot) in the German army and more than 35 years as a head of the personal department (Birgit). We asked... what happens now? And so we searched for an task for the future and found "Luxury House Sitting"... what a luck. After a year of looking and dreaming we were ready for our first arrangement... it was in Italy, a quiet house with all the amenities you can dream of. It was a wonderful time with the pets and the owner was so happy that he invited us directly for the next task. But before we started this task we got an invitation by an other owner to take care of their three cats. It was a lovely home in the area of the Bodensee in southern Germany. The owners were a wonderful and lovely couple and so we started our second arrangement. We are very happy here on this platform and we are now ready for starting tasks outside of Europe. Many thanks for sharing our story. It is an honor for us being part of this community. We have been worldschooling our daughter and traveling for several years. It happened with a single choice, slipping through the window of opportunity to celebrate our 30th anniversary while putting our household goods into storage rather than getting another house and job. We have volunteered all over and it has included longer stays while our growing girl went to a school she was interested in and we managed a BnB in Hawaii. As we returned to the Mainland after 18 months, we housesat through this website and met strangers that became like family. We appreciate the value of being able to make our family larger through those we meet and serve. We love it when folks list a need for a sitter several months in advance and for a longer than a week. We like becoming part of the community which is easier with the longer stays. We have done petsitting at most places and this has been enriching for all of us. We have gotten to love on horses, goats, chickens, turkeys, dogs, kittycats, and even a rabbit. We are grateful for the people who made the website and those who are hosts and sitters, willing to make the world a connected place to live in. It is a great life- and we love living it!